Once again I should apologise for my lack of posting, it’s been one of those years where life gets in the way of blogging. As is traditional, I’ve once again missed my Blogiversary last month (as I have every year so far I think!) oops! Anyway enough of this aimless chatter, I guess you want to know what I’ve been knitting? Well, quite few things I can’t show you yet, but all will be revealed in due course. At the moment though, I’m having a bit of rest from knitting new designs and taking the opportunity to have a go at a pattern that has been intriguing me for a little while. The pattern in question is Dotted Rays by Stephen West. I’ve chosen to use a self striping yarn, Louisa Harding Amitola, in shade #120/Winter Rose, but although there is a self striping version of this pattern (written for worsted weight yarn) I’m using the original version as it is much closer to the thickness of yarn I’m using. (Louisa Harding Amitola is sold as a DK weight yarn, but it really knits up much more likes 4ply). I’m using 4mm needles to give the fabric a nice airy feel while still keeping it soft and bouncy. It’s a really interesting construction, with increases and short rows creating a crescent shape. I’m really enjoying the relaxing simplicity of the garter stitch combined with the rhythm of the increases and short rows. It’s just simple enough to do while watching TV, yet interesting enough to occupy my mind. The other thing I’m enjoying about this project is the yarn! I wanted to use self striping yarn to highlight the unique construction of this shawl (which should be easier for you to see when I’ve knitted a bit more of it). I love the colours in this particular shade, Winter Rose. It shades from black to dark green to light grass green, then back to dark green and black and on to deep pink and repeats in this sequence throughout. I love that the colour sequence is mirrored like this, unlike Noro yarns for example, which have a more linear progression. It’s a great motivator too! I can’t wait to knit another short row wedge and get to the next colour! Which pattern have you found addictive? I’m pleased to announce that the Rockrose Scarf is now available! After making the Rockrose Wrap I wanted to see if I could make a smaller version with just one precious (100g/400m) skein of 4ply yarn, you know the sort of thing, it called to you in the shop and though you couldn’t quite resist it, you only bought one skein (two would be an extravagance). Now you want to make something with it, but what? Well, I made this! On my birthday this year I decided to treat myself to a single skein of Posh Yarn Audrey Sock (made with mulberry silk and cashmere), being such an indulgent yarn, I thought I’d just stick at one skein, but I wanted to make something elegant with it and use up as much of my precious (try not to say that in a Gollum-like voice) skein as possible. I’d been pretty pleased with the wrap version of this pattern, so I thought I could do with making a smaller version for those with less time, patience, or an aversion to lace weight yarns (I have to be in the right mood to knit with lace weight). It also gave me chance to make sure my hastily scribbled charts made sense now that I’d redrawn them neatly on the computer! I was pretty pleased with the result, this yarn is really beautiful and makes the scarf incredibly soft with a really lovely drape. Sadly Audrey Sock has been discontinued, but Posh Yarn Natasha Sock (baby camel and mulberry silk) would give a similar effect. 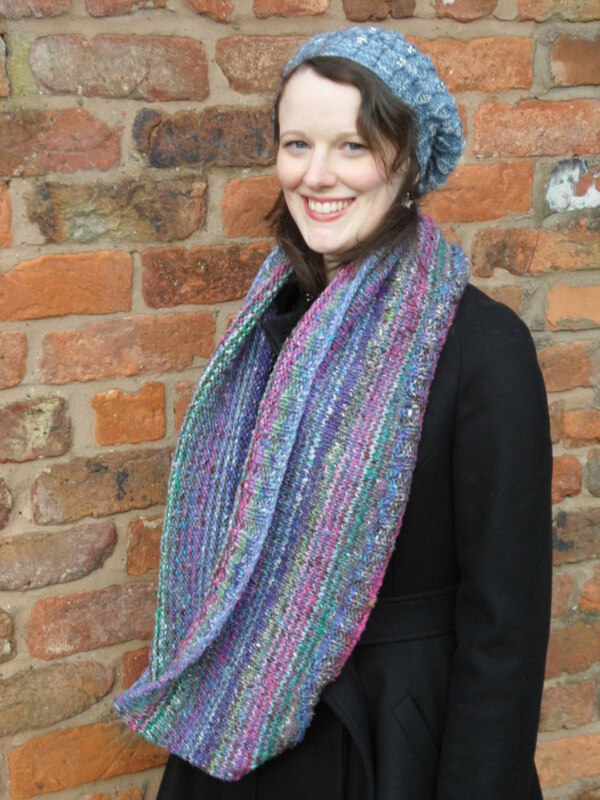 So scarf knitted, it went off to my lovely tech editor and testers and now finally it’s ready to share with you! 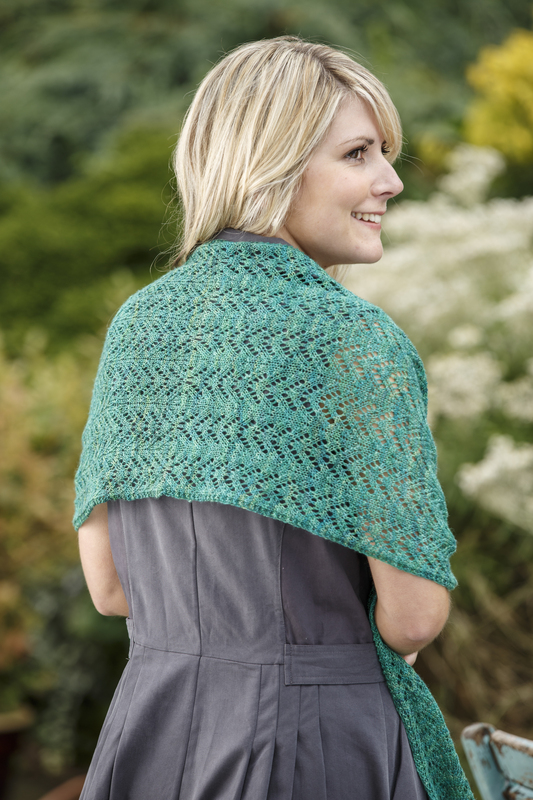 The Rockrose Scarf is the latest pattern in Wildflower: The Lace Collection eBook, available here. There are at least five more patterns to go! If you buy the collection the patterns will be automatically added to your Ravelry library as they are released. Also, if you’ve already bought the Rockrose Wrap (or if you add both patterns to your cart together), you can get the scarf version free (and vice versa, if you buy the scarf pattern you will get the wrap pattern free), just add it to your cart and the price of the scarf pattern will be deducted automatically. So, I’ve been dropping hints about exciting new things for the past few weeks and now, finally I am ready to show one of them to you! Introducing Rockrose, a delicate lace weight wrap, knitted in Fyberspates Gleem Lace with an original lace patterned border using Estonian stitches…..
Rockrose is the first pattern in my collection of floral inspired lace designs and a product of my continuing obsession with the design possibilities of Estonian lace stitches (which involve increasing rapidly into one, two or three stitches), which you can see in this close up of the border pattern. These stitches continue to fascinate me, because they present so many design possibilities, which I first explored in my Cleome shawl design a couple of years ago. 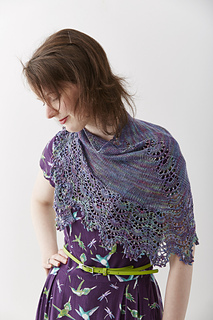 I find that they lend themselves perfectly to floral inspired lace patterns, as you can represent blooming flowers really beautifully as well as distorting the fabric into waves and ripples to make the most of hand dyed yarns, like the yarn I chose for this design, Fyberspates Gleem Lace. As well as hankering after designing something with Estonian stitches again, I wanted to play with transitions between different stitch patterns. By modifying one pattern to blend into the next one you can create really interesting effects and fun juxtapositions between stitches. Note the difference in width between the different stitch patterns, despite all patterns using the same needle size and number of stitches. Yes, I know, I didn’t block it (naughty me), but I just wanted to get an idea of some of the possibilities of different stitches (which I made up as I went along), making small alterations to each one until I had definite favourites (as well as some never-agains!). I didn’t frog the swatch back at any point and I’m glad I didn’t, as it will be interesting to look back on it (perhaps some of the other motifs will make their way into another design?). One swatch wasn’t enough though…. so…..
By this point I’d got a much better idea of the stitches I wanted to combine, so this swatch refined those ideas (you can see that the flame shaped stitches didn’t make it into the final design). Once I’d finished this swatch though, there was no time for sketching. I already knew what the wrap was going to look like and I never intended to submit the design, so I just got out my yarn and got started! Gleem Lace with my favourite dress! ‘Do you have any pictures of the wrap with the dress?’ I hear you ask? Erm… sorry, no, not any that I took (I was having too much fun), so this will have to do. So, I should probably tell you more about the wrap now, right? It begins at the centre with a provisional crochet cast on (fully explained in the pattern) and is then worked outwards in two identical halves, starting with a simple lace pattern reminiscent of leaves, which then transitions smoothly into a gently undulating pattern of petals (worked using the aforementioned Estonian stitches) and finishes with a delicate edging of blooms and a beaded picot cast off (you could leave the beads out, but it does add a pleasing weight to the ends of the wrap, helping it hang nicely). 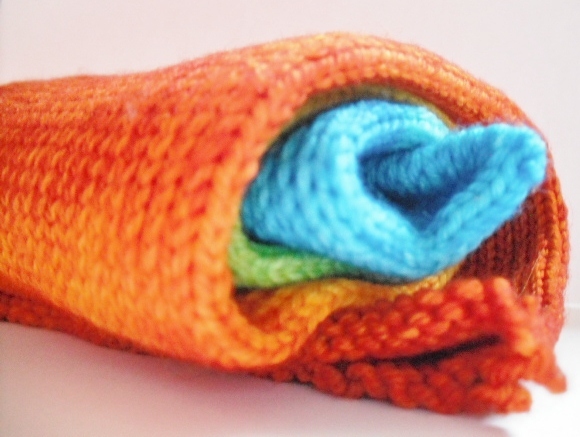 The length of the wrap is easily altered and instructions are provided in the pattern for doing so. This length is perfect both for wearing as a stole and for wrapping round your neck and wearing as a scarf. A few weeks after the wedding I took my wrap with me to the Pop Up Wool show and showed it to the lovely Jeni of Fyberspates. She loved it and asked if she could borrow it as they were having a photoshoot for some new Fyberspates patterns the next week. Obviously I said yes, so thank you Jeni, for letting me use your lovely photos! It also gave me the necessary motivation to get on and get the pattern tested and tech edited ready for it’s release. The Rockrose Wrap is available on Ravelry here, and until midnight GMT (clocks go back this weekend in the UK) Sunday 26th October you can get £1.00 GBP off the pattern! Just add the pattern to your cart and enter the code GleemLace at the checkout and the discount will be applied (do not use the buy it now feature, or you will be taken straight to Paypal). Wildflower: The Lace Collection Sneak Peek! Or you can buy the whole of the ‘Wildflower: The Lace Collection’ eBook here (making a saving on buying the patterns individually) and each pattern will be delivered to your Ravelry library on it’s release. Eventually there will be at least six different designs available in the collection, which can be purchased individually or as an eBook. You can find more details on what to expect from the collection here. I really hope you like the design, self-publishing is fun, but nerve-wracking! The parade of projects from my blog hiatus continues! This is my version of Ocean Breeze by Boo Knits, knitted in some rather indulgent Posh Yarn Robynn Sock (100% silk) and Posh Yarn Tabitha Sock (silk and mohair) in a beautiful deep pink shade called ‘May Day Is Lei Day In Hawaii’, with size 5/0 Miyuki triangle beads in Cranberry/Crystal from Crystals and Ice (their service is really good, I can’t praise them highly enough). If you’re not familiar with Posh Yarn, it’s divine, hand dyed yarn, available in one off, non-repeatable colours (hence the unusual names). Buying Posh Yarn does require a bit of dedication and possibly ninja skills or fighter pilot standard reactions! Their shop is updated every Sunday evening at 7pm (details of the upcoming updates can be found on their website as well as their fun and friendly Ravelry group) and with all the yarn being dyed in beautiful one off shades (and no more than 10 skeins of each one available) it sells out within minutes. 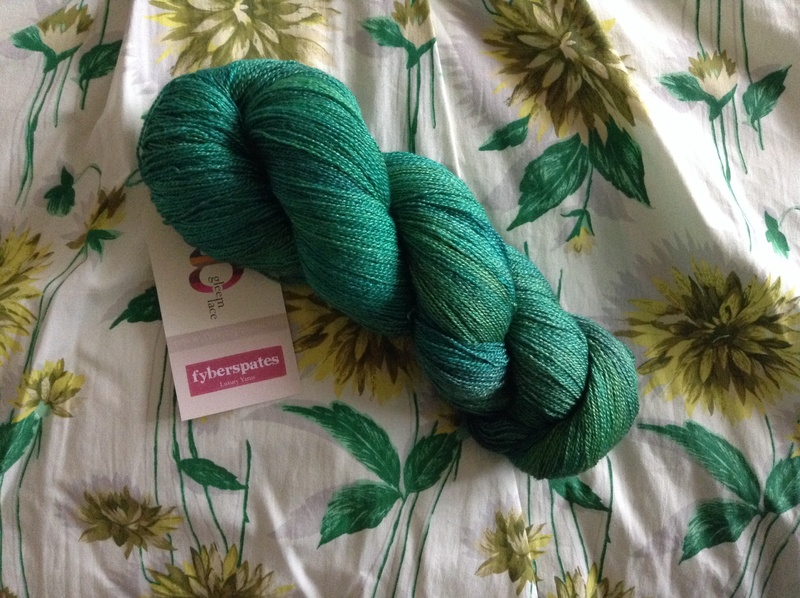 I was lucky enough to snag this yarn in a destash, it was one of just a few sets of matching yarn dyed especially for the Boo Knits Midsummer Ocean Breeze KAL. This in progress photo shows the colour a little better (it’s really difficult to capture it accurately, it’s a bit pinker and less red than most of these photos, but perhaps not quite as pink as the picture above). This is the second knit-a-long I’ve done this year, and while I did enjoy it, I think I enjoyed the Ysolda Follow Your Arrow KAL more. The pattern parts were released every few days as well, so not much time between clues, which meant I had absolutely no chance of keeping up! (Though I did start a week late, as I had something else to finish first for a deadline.) Also most parts of the pattern were fairly similar to the last part, so while it was a mystery, none of it was that surprising (not that that is necessarily a bad thing, the pattern flows nicely and isn’t disjointed like some patterns which were designed for knit-a-longs). But on the whole I’m pleased with it. The lace is very pretty and delicate, it’s a lovely big shawl and drapes beautifully (helped by the beads and the silk based yarns), but I’m not sure I’d make another. It’s perhaps a little big for my petite 5’3″ frame (thought I could fix that by using smaller needles) and I would prefer a slightly denser fabric (most of the shawl is knitted on 4mm and 4.5mm needles, which I think makes the fabric a little loose and not as neat as it could be, especially under the weight of almost 800 beads). I do like some of the other Boo Knits designs though, so I’m not ruling out trying another design, but I’d definitely alter the start to eliminate this annoying bump. So, here it comes, the first of those exciting new things I’ve been telling you about…..
…. drumroll please…. 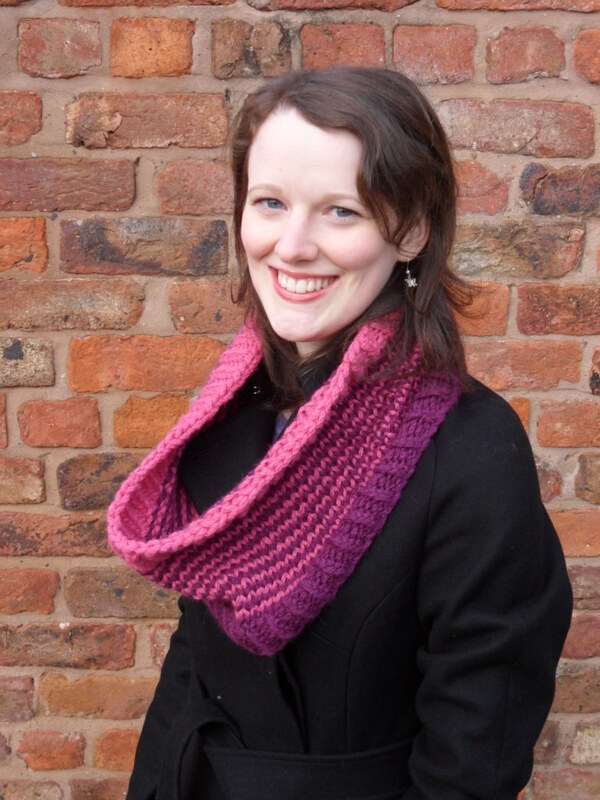 may I present my new pattern, the Hadlow Cowl! Oh yes, it’s all kicking off today! To launch my new pattern (hopefully the first of many) and Ravelry group, I’ll be holding a KAL for this speedy cowl in the group. 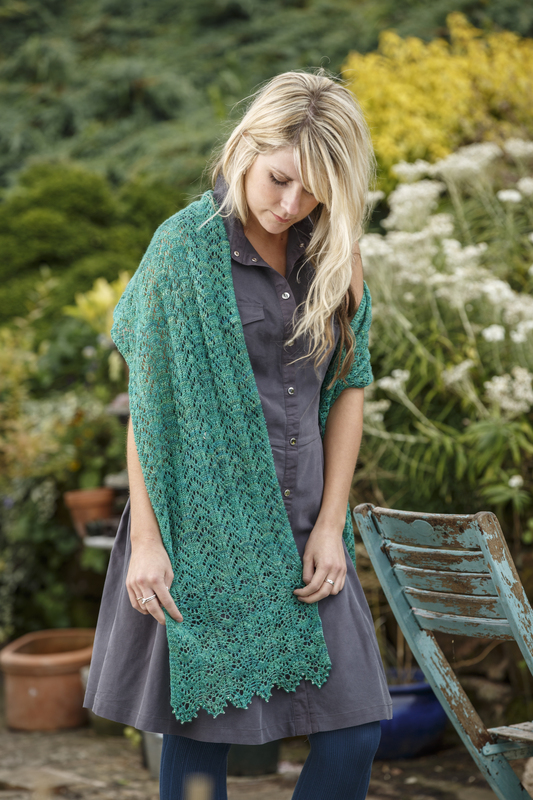 To help you join in, you can get the pattern free until midnight BST (British Summer Time) Saturday 11th October 2014 by adding the pattern to your cart and entering the code HadlowKAL at the checkout. A very straightforward pattern, this cowl is designed as a stashbuster and the pattern includes instructions for a wide range of yarn weights, from light DK/sport weight right up to chunky (as shown in the cowl above, knitted in the very snuggly Debbie Bliss Paloma). I made this cowl in an evening, so it’s perfect for quick festive gifts, for those of you who prefer to make them. The cowl is worked in the round using a clever technique called helical stripes, which eliminates the annoying ‘jogs’ you get at the beginning of each round. Not tried helical stripes before? No problem! The pattern walks you through it, and if you need more help, you can join the KAL and I’ll help you out. There are two versions, a short version, shown above (designed to use two 50g skeins of the same or similar yarns in contrasting colours), and a long version (which you can wrap twice round your neck), shown below (designed to use two 100g skeins), so you can dig out those pretty skeins in your stash that called to you in the shop but you’ve not yet found a pattern for, as well as those odd leftover balls that you just had to keep. If you’re anything like me, you probably tend to buy the same colours most of the time, so you might find that some of those leftovers go perfectly together! I’m so glad this pattern has finally been released, it’s been along time coming! I made the cowls last year, when wondering what to do with some of the odd skeins of pretty yarn in my stash, managed to get it tested before Christmas, and was then completely overwhelmed by deadlines for magazine designs, so it went on the back burner. Then the weather was warming up, so I thought I’d better wait until autumn! Never mind, having found a lovely tech editor, the pattern is finally ready, so I got there in the end. The parade of projects I’ve made while absent from my blog continues! I’d planned to post this last week, but working on exciting new things has rather got in the way….. but more about the first of those things tomorrow (I know, making you all wait, I’m such a tease). A few months ago, Knit Now magazine dropped through my letterbox, with a fun little surprise…. a knitting kit! Now, I’m not usually one for making stuff that comes free with magazines, because usually (wild generalisation alert) the yarn is not especially nice and I don’t particularly want to knit or wear anything made of acrylic when I have a stash of much nicer yarn, just waiting to be knitted up and more ideas than I have time to make (there’s no pleasing some people). But this kit was different. For a start the yarn was wool blend and actually quite nice! 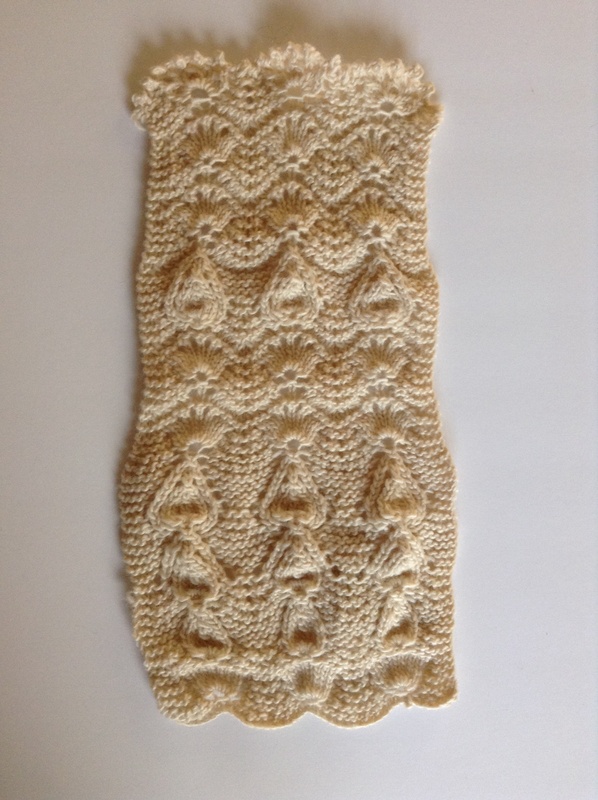 and then there was the pattern (Finlay Fox by Barbara Prime), which was more cute than I could handle. Also, I had some spare safety eyes and toy stuffing in my stash from making a pair of PG Tips/ITV digital monkeys way back when. I’d just finished a big knitting project too (more about that next week) and wanted to make something quick and slightly silly so it was just meant to be! I decided to sew each piece up as I went along, because although I don’t hate sewing up, or fear it at all, there’s always quite a bit of making up involved in toy patterns, so it doesn’t seem quite such a slog or a test of endurance if you space it out a little. ……. And before I knew it, he was done! I’m particularly pleased with his expression. Normally I spend ages sewing facial features on to toys, only for them to look weird, so I have to start again. This process is repeated until either a) I’m happy with it, or b) I’m so sick of the sight of it that I don’t care any more. I think it’s only been the latter once before, but I do tend to persevere, even if I’m pretty fed up with it, because I’m a perfectionist. On this occasion I got it right first time! Yay! Then, inevitably, I had to name him. Or, to be more precise, somebody did. The task fell to my brother (the prospective owner), who decided on Fred, because alliteration is the best strategy for naming such things! I even took Fred to work, so everyone could have a good gawp at him. Here he is enjoying some lovely colourful yarn! Isn’t he cute? You can see Fred on Ravelry here. Tomorrow, exciting new things…. all together now…. wooooooo! Yesterday I said that the BAAAA sheep shawl would bring me rather neatly on to the next project that I have to share with you. So, here it/he is, lounging nonchalantly next to some of my stash……. Meet Sidney the Suffolk Sheep (alliteration is always important when it comes to naming things)! He’s knitted in Rowan’s lovely Purelife British Sheep Breeds DK (now sadly discontinued I think) in shades #780/Ecru Blue Faced Leicester and #781/Brown Blue Faced Leicester, so he really is all sheep! 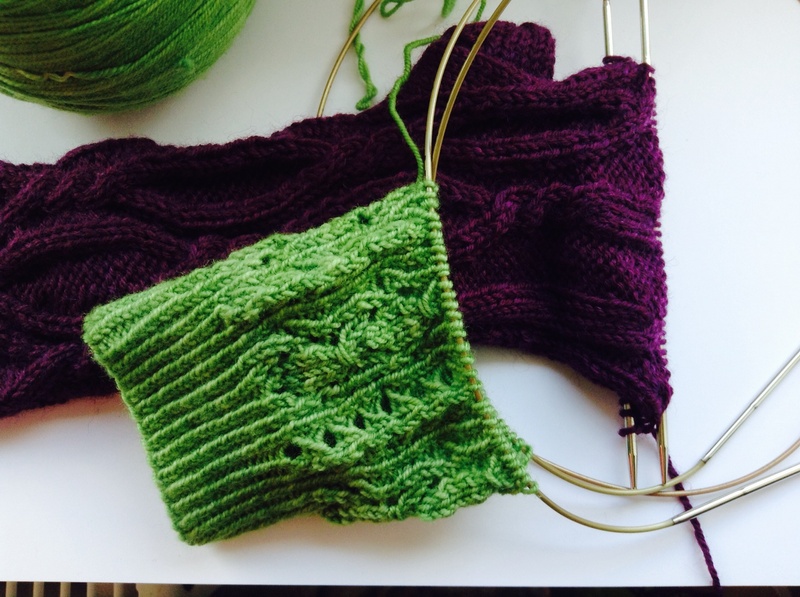 Sidney had been on my needles for quite some time (Since April 2011 to be precise – pre-blog!) so he really deserved to stop being a WIP (work in progress) and become a finished sheep. I’d finished Sidney’s body and head before he went into hibernation, which are cunningly made in one piece thanks to Janice Anderson’s clever pattern, but I hadn’t knitted his legs or ears. Poor legless Sidney. So, to avoid the tedium of having to do all the fiddly sewing up and stuffing at the end, I decided to sew up and stuff the body and head before knitting the legs, hoping that this would motivate me to finish him. It worked! Once I’d made something that looked more sheep-like I really wanted to get him finished. I made the ears and sewed them on. This did make him look a little like a rabbit, but I was informed by my brother (the intended recipient – there is a bit of a family in-joke that results in occasionally exchanging sheep related items – yes we are completely sane) that this merely gave him character and that I was therefore forbidden to change them. Soon, the legs were done and sewn up. This was a bit of a fiddle, as you have to sew them using mattress stitch and then turn them inside out (easier said than done on such a narrow piece of knitting) so the seams are on the outside of the leg. You then have to turn up a sort section at the end of the leg to form cute little hooves. The upside of this is that the legs are not stuffed, so less faffing there. Also I think it adds even more character! Next, it was on to his facial features, so I tried to give him a mischievous expression to match those impish ears. Feeling that he needed a little something extra, I decided to knit a jaunty little red neckerchief out of some leftover yarn, making it up as I went along. Every sheep about town needs a neckerchief! His ears never did lie flat…. I’m sorry my absence has been rather protracted. Life seems to have got in the way and my enthusiasm for blogging has waned accordingly. But I haven’t stopped knitting and I also have some rather exciting news of a self-publishing nature to share with you very soon! But first, what have I been knitting? Well, I don’t think I ever properly showed you my finished Follow Your Arrow KAL shawl (a fab pattern by Ysolda Teague)…. This was a really fun and interesting knit. Unlike many mystery KALs (knit-a-longs) this one had options! So for each of the five clues you had a choice of either option A or option B, giving a huge variety of finished shawls. It’s got budgies on it… I know, amazing! I seem to have amassed rather a collection of dresses with birds on! But you know the best thing about this shawl? Because of the options I chose for each of the clues, I ended up making a BAAAA shawl, entirely by accident. A sheep shawl, made of wool, perfect! Which brings me neatly on to the next project I have to share with you…. but you’ll have to wait for tomorrow for that. Today’s blogging topic is to look back at your aims at the end of the last Knitting and Crochet Blog Week and see if you have achieved them, and then look forward to next year and write about what you hope to have achieved by then. So what do I want to do by this time next year? My main aim (but please don’t judge me if I don’t manage it) is to try knitting socks. Look, I tried! I cast on two pairs, but I’ve not finished a single sock from either of them. The dark purple yarn loses alarming amounts of colour, which has put me off. After knitting just a few rounds I look like I’ve been working in a beetroot processing factory (if such a thing exists). Also the sock is quite small and inelastic because of the cables. The plan is to finish this sock and wash it to make sure it doesn’t shrink at all before I cast on the next one. But I plan to re-skein the remaining yarn and wash it before casting on the second sock. 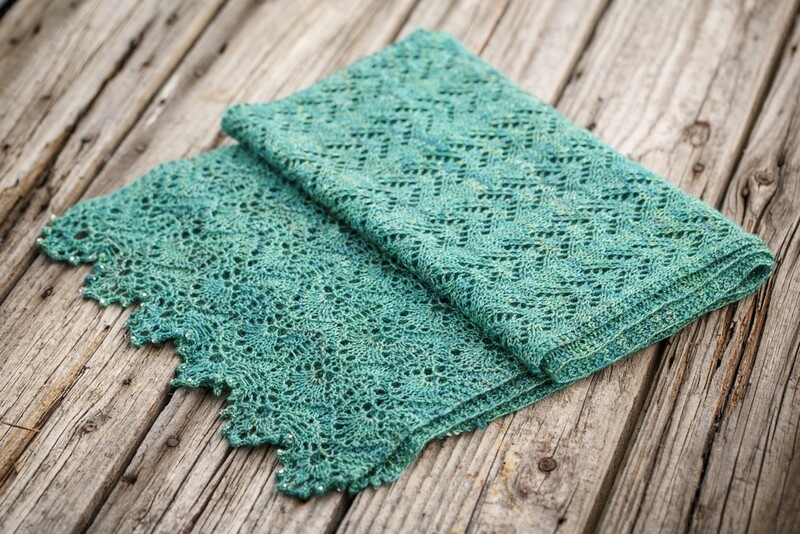 The green sock is a variation on Milfoil by Rachel Coopey (if you’ve not come across her designs before, you should check them out because they really are amazing). You’re supposed to make two similar but non matching socks, but I really don’t think I can stand having non matching socks, so I’ve altered the pattern so that the socks will match (because I’m fussy like that). but the small needles and fiddly pattern means that I’ve not yet managed to get into a good knitting rhythm with these, so they’ve gone on the back burner for now. The yarn is such an amazing springy green though! 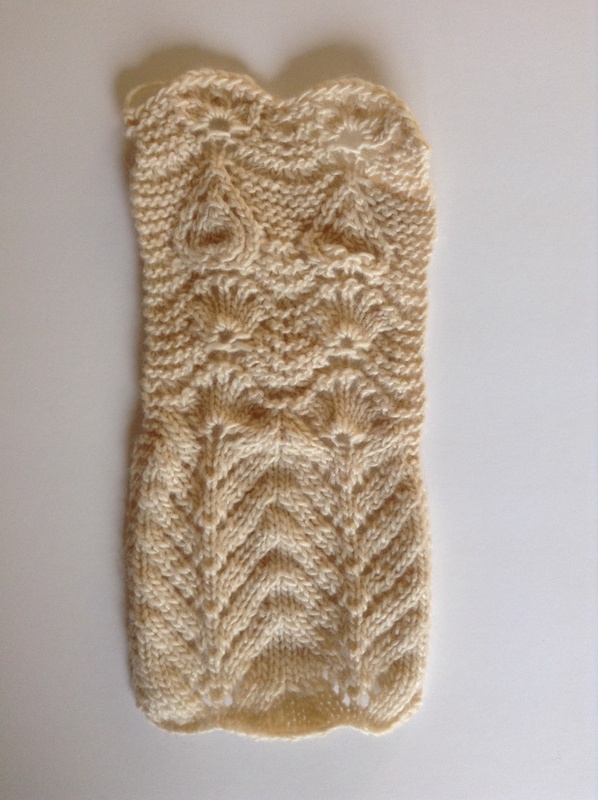 I’m still not really sold on the idea of knitting socks and hiding all that work on your feet, but I also think that there are some incredibly beautiful sock patterns available and I don’t want to miss out. So overall my feelings are still mixed, just like last year. How about Lyrica Euterpe by Romi Hill? 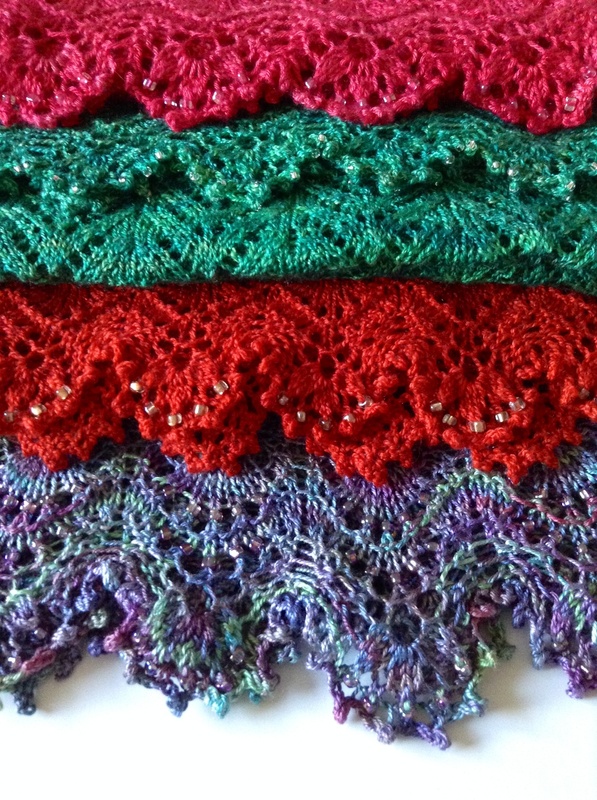 I like these sort of little shawls and wear them a lot as scarves, and this has an interesting construction, beginning with a semi-circle and then switching to a traditional central spine in the lace border. 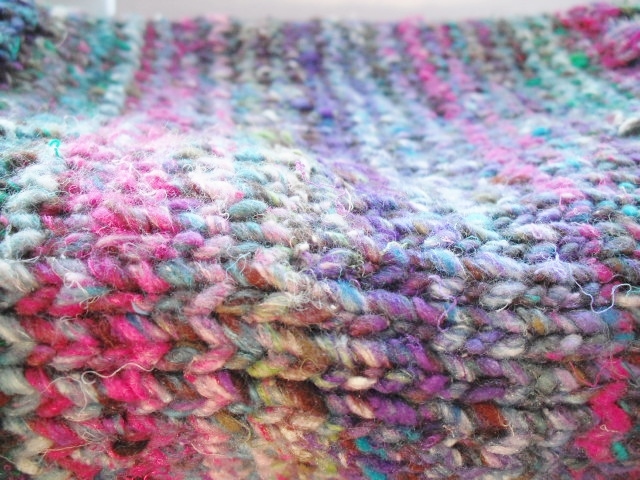 You can also add beads, although as the yarn is busy that might be a bit much! But, predictably I haven’t cast it on. I still like the shawl though, but I’m undecided about the yarn. So, overall a miserable failure. Hey ho. I can’t say I’m surprised. My knitting ambitions far outweigh the time I have to knit and it wasn’t as if I didn’t knit, I just knitted other things. Since this time last year, I’ve done several new designs (which I’m proud of) and seen them published in magazines, pattern leaflet and books, so I can’t complain. I still enjoy knitting, even though having your hobby as a career/job (hobby: knitting, day job: work in a yarn shop, self-employment: knitwear design) makes it difficult to switch off sometimes and manage your time effectively (self-employed people are their own worst bosses – you wouldn’t put up with having to work evenings, weekends and until 1am for anyone else, or expect someone else to do that for you, but I still expect that from myself). What do I want to have done by next year? Well judging by last year, mentioning anything specific seems to doom it to failure, so I think I’ll just settle for trying to improve my work/knit/life balance….. hahahahaha! Did you achieve your goals from last year?